Arepa Cafe has a steady stream of customers at the lunch hour. The narrow cafe is well-lit, and bright colours and beautiful, exposed brick walls line the room's length. A chalkboard menu reveals a variety of Venezuelan dishes: arepas (a grilled flatbread made from cornmeal, stuffed with an assortment of fillings), plus an array of hot entrĂŠes and a variety of beverages and desserts. There's also a fresh juice bar (orange, mango, cantaloupe and pineapple), and hot drinks. After some difficult decisions, my friend Liz and I find a spot by the window facing Queen West to settle into lunch. 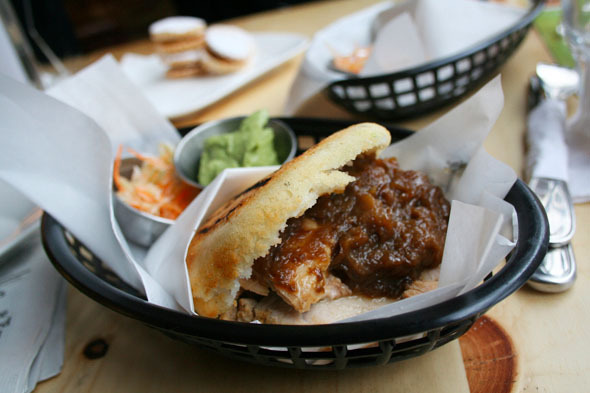 Our meals don't take long to get the table, and with elbows out, I happily dig into the Carne Mechada arepa ($6.50). It is stuffed with shredded pieces of tender flank steak, that's been simmered in a delicious tomato sauce spiced with cumin, flecked with bits of red pepper and garlic. The grilled arepa shell is buttery and its flavour reminiscent of popcorn. Pods of orange hot sauce and green guasacaca sauce are scattered in metal bowls all over the table to accompany our meal The whole process is messy and satisfying, and I'm glad I've come to lunch with a friend and not a hot date; by the end of it, there are a dozen used napkins all over the table and I'm sure there's food in my teeth. Liz digs into the Adobo Roasted Pork arepa ($6.50), which contains morsels of tender sliced pork, topped generously with sauce spiced with anatto and caramelized onions. A fresh and peppy guacamole is served alongside the fine carrot, chayote and cabbage slaw. Liz is a generous friend, and I finish the last bites of my own arepa with a glob of her guac. I couldn't resist also ordering the side watercress salad ($3.00), which is neat on a plate: baby watercress, chunks of ripe avocado, thin slices of tomato, and pickled onion on top. 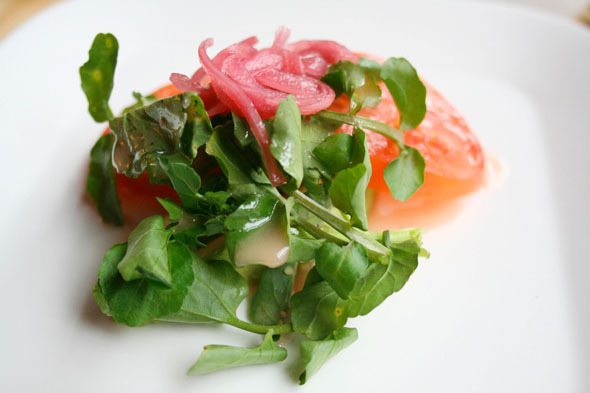 The lemony vinaigrette is refreshing and I finish the salad in less than four bites. Dessert is a sweet finish - my favourite cookies, alfajores. They feature a generous dollop of dulce de leche wedged between two sandy, sugary biscuits, dusted with icing sugar. 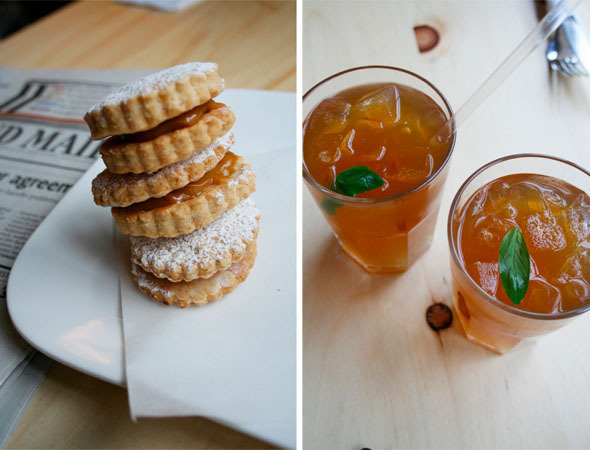 Three cookies ($4.00) go down easy with a glass of delicious, ice-cold raw brown sugar cane lemonade ($1.75). Until now, Jumbo Empanadas has been my alfajores-supplier of choice, but Arepa steps up to the plate and certainly delivers a fine biscuit. A week later on a second visit to Arepa at prime lunch hour, every table in the place is full. I try an appetizer of tequeĂąos ($4.00): buttery pastry shells stuffed with cheese, and served with guacamole. For my main, I try the Reina Pepiada arepa, which is a mixture of chicken, avocado, red onion and coriander. The filling resembles a North American chicken salad, which isn't my favourite, and lacks the kick I am hoping the red onion and coriander would have provided. To my dismay, they are out of alfajores as well as quesillo, (cream caramel), so I opt for a con leche (latte) to finish ($3.75). It is served piping hot, but could use some stiffer foam on top. Arepa Cafe's chalkboard menu reveals their offering of twelve kinds of assorted arepas: chicken, flank steak, pork, chorizo, plus fish, octopus, cheese, beans, and avocado. 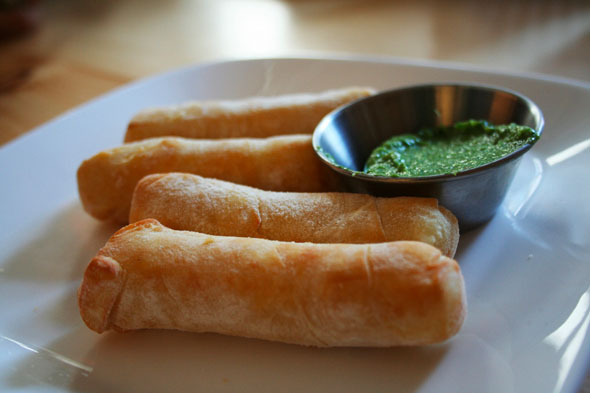 There is a modest selection of vegetarian options as well: a lentil soup; grated aged cheese and black bean, and avocado and fresco cheese arepas, as well as a vegetarian version of the pepito sandwich, which is made with a Vietnamese-style baguette. I gather that highlighting their vegetarian-friendly options on the menu would make it easier to navigate. What is just as noteworthy as the perfectly scalloped edges of Arepa's alfajores, is the great service, which is patient and kind. Questions are answered kindly and recommendations are made. It's also nice to see Eduardo Lee, co-owner, in the kitchen and on the floor himself, flipping arepas on the hot grill, clearing tables and bringing orders out. 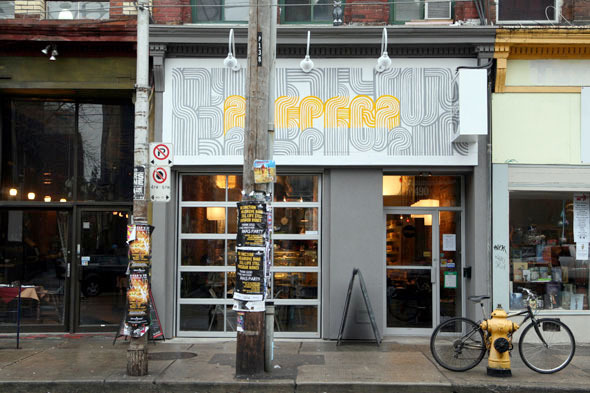 All in all, I am pleased to see that Arepa Cafe has filled this vacant spot on Queen West, as well as the gap in Venezuelan cuisine offerings in Toronto. With growing interest and exposure to the Queen West crowd, I hope the quality of service and food will stay high with increased patronage. I look forward to my next visit to Arepa, in hopes that this time they will have alfajores-a-plenty for me to stock up on! 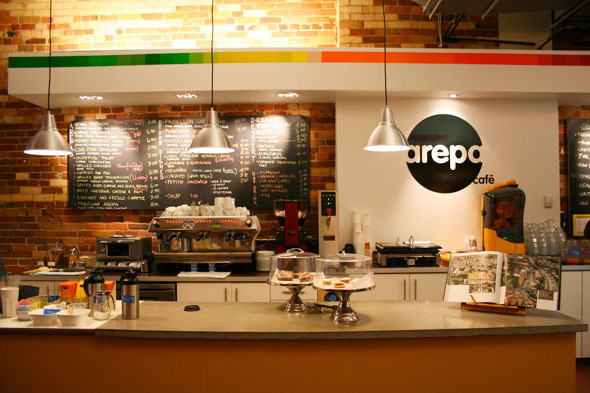 Arepa Cafe is open Mondays and Tuesdays from 10 am to 7 pm, on Wednesday to Saturday from 10 am to 9 pm, and on Sunday from 11 am to 6 pm. Follow them on Twitter @arepatoronto.